Vast greenhouses that use sea water for crop cultivation could be combined with solar power plants to provide food, fresh water and clean energy in deserts, under an ambitious proposal from a team of architects and engineers. The Sahara Forest Project, which is already running demonstration plants in Tenerife, Oman and the United Arab Emirates, envisages huge greenhouses with concentrated solar power (CSP), a technology that uses mirrors to focus the sun’s rays, creating steam to drive turbines to generate electricity. The installations would turn deserts into lush patches of vegetation, according to its designers, and do away with the need to dig wells for fresh water, an activity that has depleted aquifers across the world. Charlie Paton, a member of the team, and the inventor of the Seawater Greenhouse, said the scheme was a proven way to transform arid environments. “Plants need light for growth but they don’t like heat beyond a certain point,” he said. Above certain temperatures the amount of water lost through leaves’ stomata rises so much plants stop their photosynthesis and do not grow. The solar farm planned by the project runs seawater evaporators, pumping damp, cool air through the greenhouses. This reduces the warmth inside by about 15C, compared with the temperature outside. At the other end of the greenhouse from the evaporators, water vapour is condensed. Some of this fresh water is used to water the crops, some for cleaning the solar mirrors. The designers said that virtually any vegetables could be grown in the greenhouses. The demonstration plants already produce lettuces, peppers, cucumbers and tomatoes. The nutrients to grow the plants could come from local seaweed or be extracted from the seawater. Paton said the greenhouse produced more than five times the fresh water needed to water the plants inside, so some of the water could be released to the outside, creating a microclimate for hardier plants such as jatropha, a crop that can be turned into biofuel. 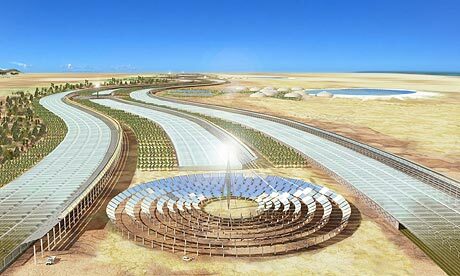 The cost of the Sahara Forest Project could be relatively low as both CSP and Seawater Greenhouses are proven technologies. The designers estimate that building 20 hectares (nearly 50 acres) of greenhouses combined with a 10MW CSP scheme would cost about €80m (£65m). Paton said groups in countries across the Middle East, including in UAE, Oman, Bahrain, Qatar and Kuwait, have expressed interest in possibly funding demonstration projects. He said use of Seawater Greenhouses could reverse the environmental damage done by the glasshouses already built in places such as the desert region of Almeria, southern Spain, where, constructed over the past 20 years to grow salad crops, they now covered more than 40,000 hectares. Governments should invest in the technologies and “not be distracted by lobbyists promoting dangerous nuclear power or nuclear-powered desalination schemes”, Crumpton added. The International Energy Agency estimates that the world needs to invest more than $45 trillion (£22.5 trillion) in new energy systems over the next 30 years. Who Wants To Be CEO of a Red, White and Blue Kakistocracy*? Given the wonders of modern technology, including Solar powered gas pressure sealed system refrigeration ( still a state secret in the U.S.) commonly found in small hospitals in Africa, The power of Solar distillation, Solar/steam electric power generation and Solar Electricity by photovoltaic cells, any place with lots of sunlight becomes “Energy Blessed”, especially desert regions, where any small gain is significant and the supply of sun is infinite. The days of cheap oil are gone, mankind embarks on the last frontier, Solar energy, in its many forms yet to conform to our needs and wishes. As we watch the American “cheap oil” era die away the world faces a new time, a time of clean abundant power wherever the sun shines, and must adjust its demands accordingly. Life will go on, just not in America, and certainly not extravagant as Americans need for survival, where each living soul required acres of arable land to provide meat for dinner, and the worlds oil resources for transportation. The rest of the people of the modern world live moderately enough to appreciate the new, clean energies, and will apply them towards a frugal, efficient lifestyle, maintaining low body sizes and weights, thereby not overtaxing the whole of the system. Good Bye Yankee Doodle, you were great entertainment while you lasted and we, the poor people of the world will miss your fat asses in our skinny faces and your military force up our asses, but not for long.